Like our PKI 6700, the PKI 6710 jammer is portable, too. Besides the conventional frequencies, often the mobile communications range is used for the remote control. It is possible to prevent this with the PKI 6710 without problems. Here, too, the possibility to communicate via mobile phone in the GSM range is blocked by means of optimised interference technology. In addition to the remote control systems, the communication channels via GSM (telephony, SMS) are completely disturbed. And again, the operation is very easy. One switch is sufficient to start the jammer, all the rest is done fully automatically. 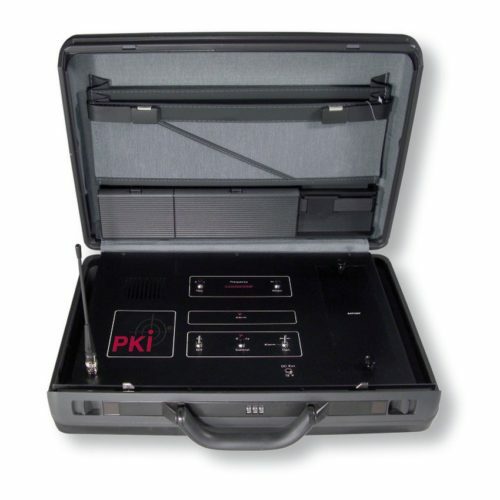 External antennas are not required for this frequency range and the briefcase can thus serve its purpose in an absolutely inconspicuous way. The internal chick-charger is highly efficient and the integrated deep-discharging protection provides for an early alert.